Princess Cruises has revealed a brand new livery on the upcoming cruise ship Majestic Princess. The new livery design was revealed during the cruise line’s first Chinese purpose-built ship float out ceremony. The new design is the iconic Princess logo which covers the ship’s bow. 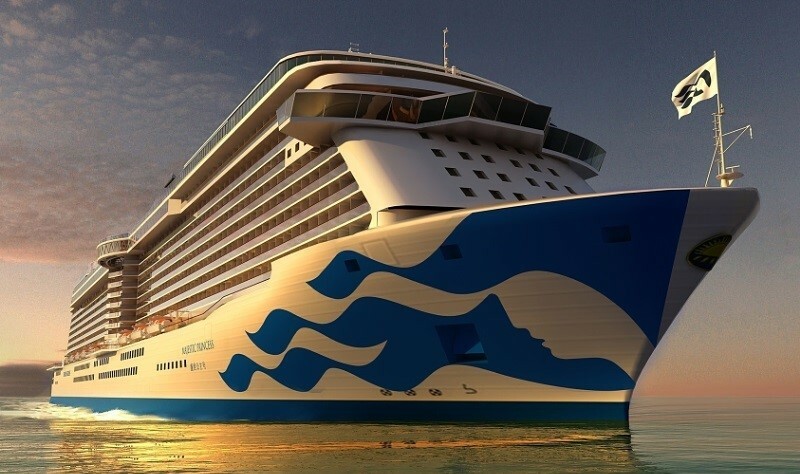 The logo will showcase Princess Cruises and its ships across the globe including the growing Chinese cruise market. The new hull artwork will help take Princess Cruises into a new era with a modern-sophisticated look. The new livery artwork will roll out across the Princess fleet over the coming years. The artwork continues a trend which cruise lines have been doing for years. Norwegian Cruise Line, Aida Cruises and more recently P&O Cruises also showcase artwork on their ship hulls. The 143,000 gross ton Majestic Princess will home-port in Shanghai and carry 3,560 guests. Princess Cruises announced the ship’s inaugural sailings three months ago.